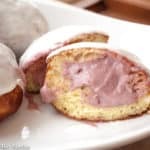 This recipe for Lemon Doughnuts with Raspberry Cream is for the Great British Baking Show Bake-Along. Easy fresh homemade doughnuts? Yes, please!